The Royal Tenenbaums is the story of a family brought back together by their ailing, estranged patriarch. The young Tenenbaum children are all prodigies; Chas is business savvy, Margot, who was adopted, wrote a successful play, and Richie is a tennis star. Their parents, Royal (Gene Hackman) and Etheline (Anjelica Huston), are getting a divorce. Twenty two years later, Royal is getting evicted from his hotel room where he has been staying. After hearing that his wife’s accountant, Harry (Danny Glover) is trying to marry Etheline, Royal devises a plan and says he is dying of cancer and wants to stay in their house and reunite the family. As adults, the children are all in post-success slumps. Chas (Ben Stiller), is still in business but has become obsessively protective over his sons after their mother’s death. Margot (Gwyneth Paltrow), is married to a neurologist named Raleigh St. Clair (Bill Murray) but hides her life from him. Richie (Luke Wilson) had a breakdown as a tennis star. When a film has a huge ensemble cast, it is easy for the plot to get lost in the mix but Wes Anderson not only keeps the characters unique and interesting in The Royal Tenenbaums, but the plot is one of his best too. Each character has their own cross to bear and when they are under the same roof again, their stories are interesting on their own, but together they become something special. Admittedly, there is a lot to take in and some of the quirk that is special to Anderson’s films may put some people off but I would argue that The Royal Tenenbaums is possibly Anderson’s most accessible film. I watched The Royal Tenenbaums again after watching Moonrise Kingdom for a second time and when viewed back-to-back, the films are actually very different in some respects, though both very Anderson-y. Where Moonrise Kingdom cranks the ’60s nostalgia and colors all the way up, The Royal Tenenbaums is brightly colored but also kind of washed out. 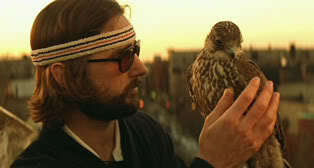 The Royal Tenenbaums feels more realistic but also has many of the same fantastical things that Anderson is known for. The Royal Tenenbaums is clearly intended for adults but Moonrise Kingdom would likely be enjoyable for young teens and adults for different reasons. It’s difficult to speak of Wes Anderson’s films since he has crafted such a unique “formula” for his work. While, at times, this style can be a bit too much or get in the way of the storytelling, but The Royal Tenenbaums is more of a character story with great, innovative set pieces and shots. That’s not to say that The Royal Tenenbaums is a serious film, it’s actually quite funny, but the camp aspect is scaled back a bit. 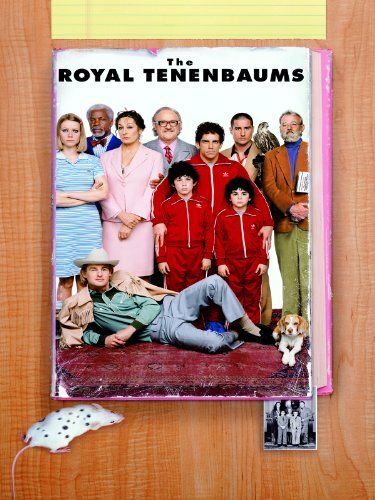 The Royal Tenenbaums was recently released on blu-ray by the Criterion Collection and is an improved package over the DVD edition they also put out. The special features remain the same, but they are spectacular for fans of Anderson’s work. The commentary and behind the scenes footage are worth it alone, but the set offers much more. The picture and sound are both spectacular, as expected. The Royal Tenenbaums was my favorite Wes Anderson film before Moonrise Kingdom came out. I had a guy stop me in Barnes and Noble a few weeks ago asking my opinion of the movies he was holding. He had Bottle Rocket, Rushmore, and The Royal Tenenbaums in his hand and said he had never seen a Wes Anderson movie before. I gave my brief impressions of each and asked which sounded the best to him, he picked Rushmore and I went along with it but urged him to check out Moonrise Kingdom if he liked it. If I had seen the blu-ray presentation of The Royal Tenenbaums before that conversation, however, I would likely have steered him differently. I give it 4 Mordecais out of 5. Bottle Rocket follows a trio of friends that plans a series robberies and then goes on the run. At the start of the film, Anthony (Luke Wilson) is voluntarily staying at a mental hospital for exhaustion. His friend, Dignan (Owen Wilson), plans to break him out of there, not knowing Anthony is there voluntarily. Dignan then tells Anthony about his 75 year plan, which involves a series of robberies and to meet up with Mr. Henry (James Caan). They include their friend Bob (Robert Musgrave) on the plan as their driver. The three steal a small sum of money from a bookstore and then go on the lam, staying at a small motel. Anthony ends up falling in love with one of the housekeepers, Inez (Lumi Cavazos). Upon returning home, they meet up with Mr. Henry for another big heist that doesn’t go to plan. While I realize the description of the film sounds kind of dark and action-packed, this is a Wes Anderson movie. His first full-length film, actually. Fans of his work will recognize many of his signature touches in the soundtrack, the characters, the dialogue, and the editing, but his style has certainly been refined over the years. Whereas Moonrise Kingdom has all of Anderson’s touches pushed to their limits, Bottle Rocket seems very subdued in comparison. Some may consider this a good thing but I personally prefer Anderson’s later work. The Wilson brothers (the lesser-known Wilson brother, Andrew, also has a small role) are in their feature debut too and it’s actually refreshing to see them so young. 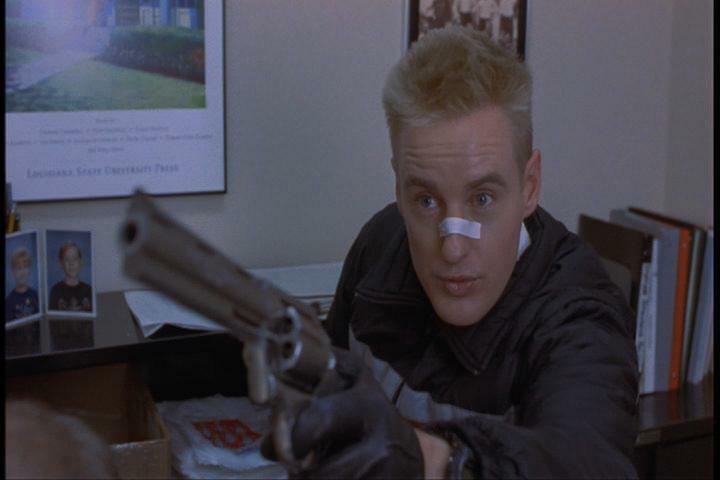 I’m not much of a fan of Owen Wilson, who also co-wrote Bottle Rocket with Anderson, but as Dignan he is likable. The plot meanders a lot but it’s not necessarily a fault so much as its a quirk. I can certainly understand why it would be off-putting to some, but the showcase here is more on the characters and their adventure rather than the adventure itself, that’s just how Anderson’s films are. Fans of Anderson will no doubt enjoy Bottle Rocket but I would be surprised if it ranks high on the ‘favorite’ lists of many. While it’s not a bad film, Anderson has clearly grown as a writer and a director, even for his sophmore film, Rushmore. If you are new to Wes Anderson’s films, I would recommend starting with another film (personally, Moonrise Kingdom is my favorite) and then work your way through the rest of his catalog. 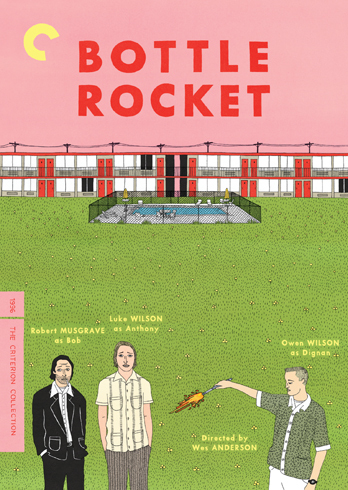 Bottle Rocket is fun and enjoyable but doesn’t always feel deeper than the short film it’s based on. I give it 3 “why is there tape on your nose?” “exactly!”s out of 5. 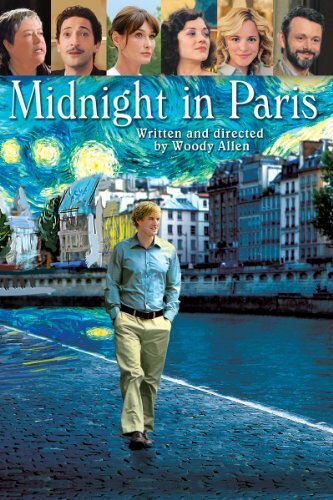 Midnight in Paris is one of the few Woody Allen films where he remains behind the camera and lets an actor (in this case Owen Wilson) take the main role. In the film, Gil Pender (Owen Wilson) is a screenwriter writing his first novel who has traveled to Paris with his fiancee, Inez (Rachel McAdams), for a vacation with her parents. Gil is truly the odd man out, even with Inez’s friends. One night after a party, Gil is walking alone when an “antique” limousine approaches and the occupants welcome him inside. He discovers he has traveled back to the 1920s, an era he had previously wished to have been a part of. For the most part, Midnight in Paris works fairly well. It captures some of the most romantic ideas about Paris culture throughout the past 100 or so years and if nothing else, solidifies our love affair with the city. Although it’s a bit of an atypical Allen film, it works. 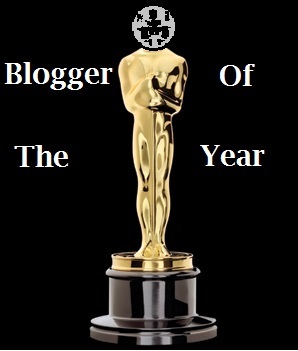 I found the people in Gil’s present-day life to be insufferable, it made me grit my teeth at times. In fact, they made me lose some interest in the film. When Gil is in the 1920s meeting celebrities of the time, Midnight in Paris becomes a wonderment, but for the most part, the present-day sequences just grated me. Perhaps it would be more tolerable on a second viewing. I should also point out that Owen Wilson bugs me in most films, but I think he fits in quite well with Allen’s persona and sense of humor. He’s part Wilson and part Allen, not quite taking his role to the levels of an impersonation of Allen, but dialing it back enough so that it’s uniquely him. I am far from an expert on Woody Allen films, but of the handful I have seen, I would rank Midnight in Paris somewhere in the middle. It almost seems like the Woody Allen film for people that don’t care for Woody Allen films, so take that as you will. 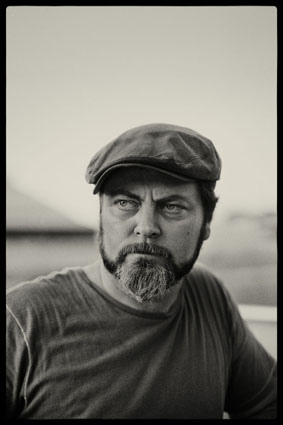 I give it 3 I really wish Nick Offerman played Ernest Hemingways out of 5.